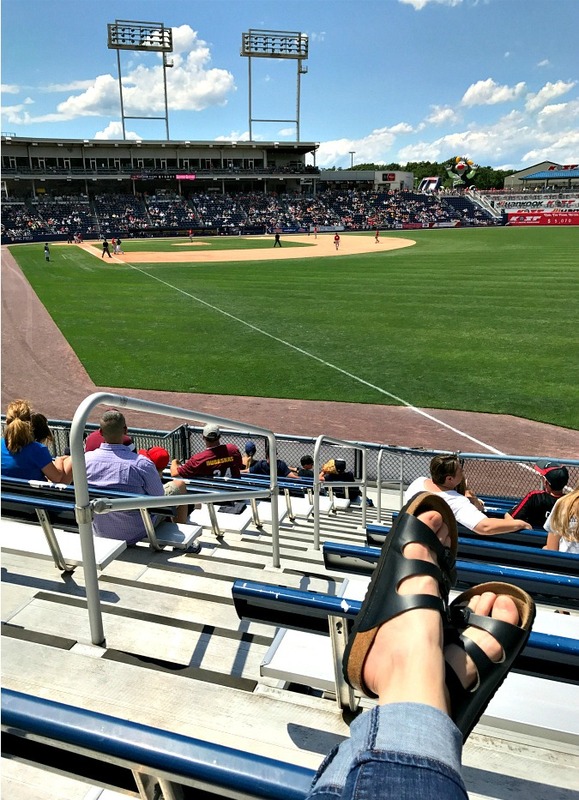 yesterday, we spent the afternoon enjoying our sunday at the scranton/wilkes-barre railriders baseball game. even though we're not sports fans, we couldn't pass up the discounted tickets that were being offered to the staff at the university where i work. we made a date of it and had a great time. even though we had downpours in the morning, the skies were blue and the sun was shining by the time the game started. the weather was gorgeous for the entire game. we sat out on the bleachers soaking up the warm sun and watching the game. one of my former students has a great position as the director of all the video that happens at the stadium. we saw her while we were there and she took us inside the control room which was really cool. since she knew where we were sitting, she sent a camera over to us in the middle of the 6th inning to show us on the "kiss cam" during the game. it was cute! we had a great sunday date at the baseball game and our home team won too! here are a few pictures i snapped on my phone . . .
Looks like the weather was really beautiful for a ball game.